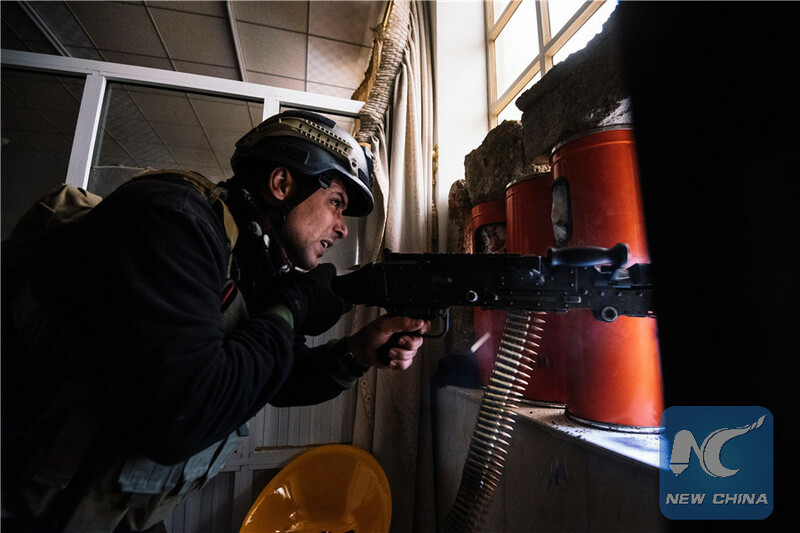 MOSUL, Iraq, Jan. 18 (Xinhua) -- Iraqi security forces on Wednesday announced complete control of the main part of the eastern side of Mosul after defeating extremist militants of the Islamic State (IS) group. "The Counter-Terrorism Service (CTS) forces have completely retaken control of the eastern side of Mosul," Lieutenant General Talib Shghati, the commander of the CTS forces, told a press conference near Mosul. "The only neighborhoods left in Mosul are in the northern part of the city which the army units are fighting to liberate soon," the commander added. Shghati also said Mosul's five bridges over Tigris are all under the control of the security forces. The CTS troops have so far killed 3,300 IS militants and destroyed 300 car bombs in the battles of Mosul, according to Shghati. His announcement came after the elite CTS troops freed central areas on the eastern side of Mosul after recapturing the archaeological site and the adjacent Tal Nirgal area, the last areas assigned for the CTS forces within the major offensive to free Mosul from IS militants. Also in the day, army soldiers made a new advance on the northern front of eastern Mosul when they recaptured al-Qadhiyah neighborhood and are fighting on the edges of the adjacent al-Arabi neighborhood, according to a statement by the Joint Operations Command. On Tuesday, the CTS forces made fast advances against IS positions in Mosul and recaptured ten neighborhoods, making the Iraqi troops closer to recapturing the whole eastern bank of the city. According to military officers, the Iraqi forces have recaptured roughly 95 percent of eastern bank of the Tigris River which bisects Mosul. Once they recapture the whole eastern side they will begin a new phase of the anti-IS major offensive on the western part of the city. On Dec. 29, the CTS commandos, army troops and federal police launched the second phase of a major offensive to free the eastern bank of Mosul. Last month, battles in Mosul slowed down as extremist militants used civilians as human shields, resorted to suicide car bombs and made mortar and sniper attacks in stiff resistance. On Oct. 17, Iraqi Prime Minister Haider al-Abadi announced a major offensive to retake Mosul, the country's second largest city. Since then, Iraqi security forces, backed by international coalition forces, have inched to the eastern fringes of Mosul and made progress on other routes around the city. Mosul, some 400 km north of the Iraqi capital of Baghdad, has been under IS control since June 2014, when Iraqi government forces abandoned their weapons and fled, enabling IS militants to take control of parts of Iraq's northern and western regions.